Open for maximum intensity. Equipped with a 425 hp M TwinPower Turbo inline 6-cylinder gasoline engine and innovations from motorsport, if you are living in the Milton area and seeking a high powered, exceptional driving machine, the BMW M4 Cabriolet ensures the most direct connection between adrenaline-filled high performance and all-out driving pleasure. This BMW M4 Cabriolet is the perfect driving machine for people living in Milton and you can get some of the specifications for the vehicle right here. In the vehicle’s interior, the redeveloped M seats with their shell shape and illuminated M logo await the driver and front passenger. They offer perfect side stability and a clever use of ergonomics enables a direct connection between driver and vehicle. All control elements in the cockpit are orientated around the driver and guarantee highly precise operation in split seconds. A round instrument display in a racing car look, M leather steering wheel and M gear shift lever finish off the package and leave no room for doubt. 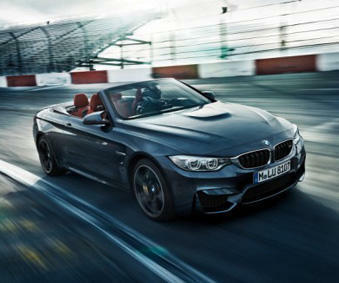 The BMW M4 Convertible was created for the residents in Milton to drive, and to redefine barriers. When the BMW M4 Convertible accelerates to the limit in next to no time, the significance of power can be experienced with all senses. The boost stays finely adjustable even in the highest rev ranges. And thanks to numerous motor sport technologies such as the Active M Differential or M Servotronic, the BMW M4 Convertible reacts in every situation exactly as you expect of a top-class athlete: with high precision and absolute technical perfection. BMW is known for and has a long history of creating exceptional driving machines with a variety of features. If you are living in the Milton area and you are looking for a BMW vehicle that is technically innovative with attractive design language, and gives you an exhilarating and dynamic driving performance, Come see us at Budds’ BMW Oakville. We will provide you with outstanding customer service from the moment you step foot in the dealership!